So I got sent this from one of my gym buddies. 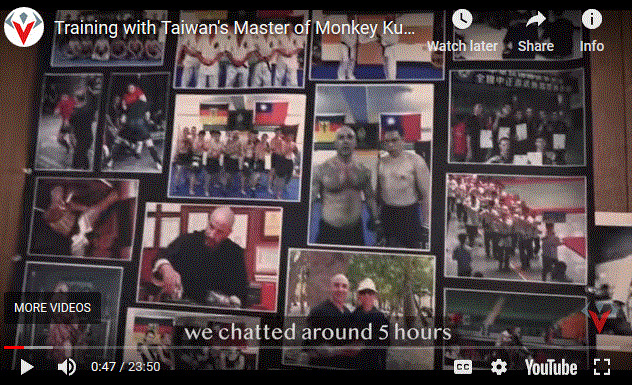 These guys who are into fitness (unlike me, whose currently into fitn'ess pizza in my belly) stayed in taiwan (a place my more kung fu enthusiastic acquaintances make out to be the be all and end all place for chinese martial arts) and went to this monkey kung fu school. Now I've watched a few clips, and the teacher seems to at least be free of significant woo. There's a video of body hardening I think some of you will know a lot more on than me. Last edited by kimjonghng; 3/14/2019 1:55pm at . That looks like chinese kyokushin. I was worried until the guy started calling out CMA guys for being incapable of applying their **** in competition. some bits of the application video remind me of softer styles, but the kyokushin and karate vibe is something I picked up on as well. The teacher in question really looks like he knows his stuff, but I am seeing on his insta that a lot of stuff is #flatearth and #specialforces. Kung fu brings out the creative / batshit side of people, usually depending on other factors (like why they learn kung fu). It's a natural outlet of the mind and body's spiritual bonds being tested, sometimes in some pretty intense, gruesome ways. It can lead all sorts of places, everything from physical injury to total delusion to the Great Doubt of Chan Buddhist philosophy. There is a whole spectrum of nei gong associated with physical and mental issues, too, and it's often said inside real schools that training "the internal" wrong can, essentially, lead you to the more batshit side. Since a lot of meditation involves various practices from esoteric to relatively benign, I'm inclined to agree that such practices are best taken only the instruction of a legitimate master. That doesn't mean training kung fu will make you believe in Flat Earth ****, what's more likely is that it's more likely that the process of learning (especially the more esoterica in the style) make you question your own perceptions. That of course is normal, natural, and a big part of Shaolin training. But beyond that point, it's more or less a matter of what your reality is starting from. for some people, reality is Facebook. My kids reality is Youtube and Instagram. If you already have a loosey goosey view of the "real world"...you're gonna tumble down the rabbit hole without any control. Youtube is one of those things I seriously feel some concern for the general masses having access to, given how it is becoming a place for reactionaries, political idiots across the entire left-right spectrum and 'too hot to handle' news outlets (by which I mean, baseless claims and false narratives). I usually use it to listen to readings of old philosophers while I drive and fight commentaries. Couldn't agree more. Especially it's corruptive influence on children. To mature adults, Youtube content is often annoying or offensive at worst. To a kid, Youtube can alter the course of their entire future. There are already documented cases of cults nabbing young people through Youtube series. One click away. The nice thing about these kinds of Kung fu videos (compared to say 10-15 years ago) is that it's easier than ever to verify a lineage, which is the first part of determining if you're stepping into bullshido or not. If the lineage is legit, one less thing to worry about. Even then, you might find a specific teacher (or chain of them) who teach something not quite kosher to the realm of objective reality. This is especially true in CMA. CMA's ancient roots have had more time to be corrupted and resold as cult bait than almost any other I can think of. I occassionaly speak to people of other martial arts backgrounds and frankly it doesnt even seem like a time thing. Taekwondo, for all it's youth, has been bs'd into infinity by nationalism and lies. Interesting point, I just took my son out of TKD school after he got his green belt. The school was fine, decent place to train and had MMA classes etc, but there was a lot of South Korean nationalism in there too, because of how they name the forms, "historical" information they require for testing, etc. When you compare a much older art form (like southern Chinese kung fu styles) with TKD, you can start to see how the nationalism aspects bake in over centuries, and other cultural trappings until the style itself is almost (and sometimes is) lost completely. Wing Chun is a great example of a style that has practically become 99% style and 1% substance. Monkey styles not so much, I think, because they still require a decent level of agility and stamina. 100 years from now, when there are a billion TKD students, Choi Hong Hi will be like Jee Sin Sim See is in China today.